What routes did Marco Polo follow Venice to Hormuz? At the completion of this lesson plan, students will be familiar with China, Central Asia, and the Silk Road in the time of Marco Polo. Marco Polo's father and uncle returned to Venice when he was 15 years old. Two years later, when they set off again for China, they decided to take Marco with them. The Polos began their long journey by sailing across the Mediterranean to Acre (in modern Israel). Tell the students that they will take an imaginary or “virtual” trip with Marco Polo from Venice to China and back. The first leg of the journey ends at Hormuz. Have your students download and print (or hand out print copies of) the PDF Marco Polo: From Venice to Hormuz, which has a chart for taking notes, guiding questions as well as a map activity and a "postcard" template for the final assessment. Access Marco Polo's Route: available through EDSITEment-reviewed resource Asia Source. Using the cursor, trace their route from Venice to Acre. From Acre, they sailed up the Mediterranean coast to modern Turkey. They then followed a trade route across Turkey and Armenia. 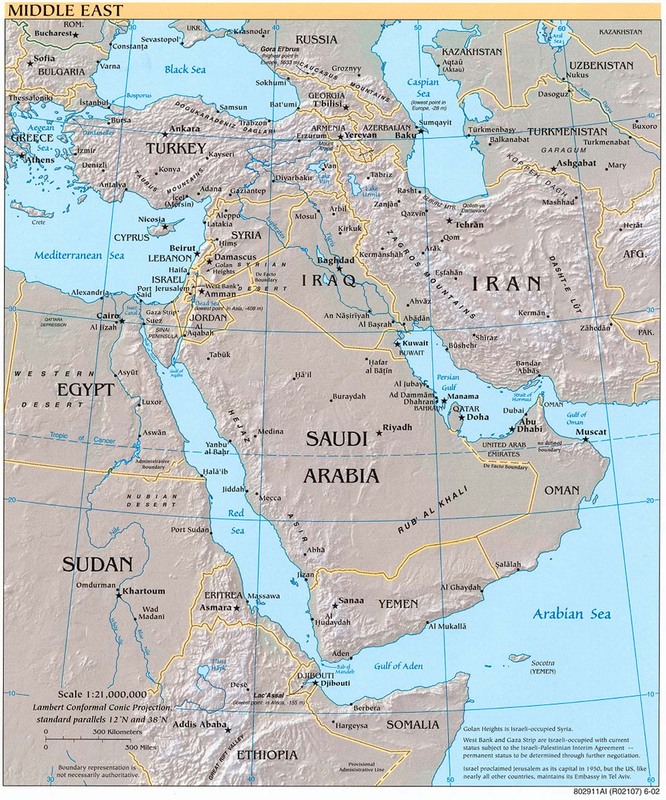 Access the map of the Middle East available through SARAI. Find modern Israel; then trace the route taken by the Polos up the coast to Turkey and Armenia. Why did the Polos begin their journey to China by sea? How would you describe the geography of the regions of Turkey and Armenia that the Polos traveled through? What might have been their means of travel from Acre through Armenia? From Armenia the Polos turned south and proceeded through Persia (modern Iran) to the port of Hormuz at the mouth of the Persian Gulf. Iran is an elevated plateau with an average height of over 3000 feet above sea level. The Zagros Mountains cover much of the western half of the country. The only fertile area is in the north, along the coast of the Caspian Sea. The flatter regions in the center of the region are arid deserts. Elevation map of Iran available through Ask Asia. Where are the highest mountains located? Return to the map of the Middle East. Find the Zagros Mountains and the Strait of Hormuz (north of modern Oman). Have the students trace the route taken by the Polos from Acre to Hormuz on the large map in the classroom. Have them explain why they took this rather indirect route. (By doing so, they avoided two large rivers (the Tigris and Euphrates) as well as the towering Zagros Mountains of Persia). What are the geographic features of modern Iran? What factors determine the easiest route from Acre to Hormuz? Since ancient times, sheep and goats have grazed in the mountains of Persia. Their wool is used for clothing and blankets, but a Persian specialty has long been the woven carpet. In fact, the tomb of Persia's King Cyrus, who died in 549 BCE -- 2500 ago, was covered with precious carpets. In medieval times, Persian carpets were greatly admired in other parts of the world and were a major item of trade. You can learn more about the history of Persian carpets by accessing the following sites available through the Internet Public Library. Instruct the students to each create a picture postcard that a medieval traveler might have sent home from Persia. One side should contain a picture (downloaded or drawn freehand) of a geographical feature or a local product. The other side should contain a brief message describing some of the highlights of a journey from Acre to Hormuz. The PDF Marco Polo: From Venice to Hormuz has a simple template and instructions for the postcard activity. Alternatively, you might hand out large, unlined index cards for your students to use as postcards.